With a wide press following, Mark Gasser has been described as “Scintillating and poetic... totally at one with his instrument” (Chris Morley, Birmingham Post). Paul Driver from the Sunday Times describes Mark as having "a staggering technical command". Mark Gasser was born in Sheffield - 1972. A student at the Birmingham Conservatoire with John Humphreys, he graduated with the highest marks in the Institute’s history. At the Royal Academy of Music he graduated once again with Distinction, and more recently was inducted as an honorary life member of the Conservatoire. A critically acclaimed pianist he has an especially broad repertoire from Bach and Purcell to contemporary music including over 70 concerti. 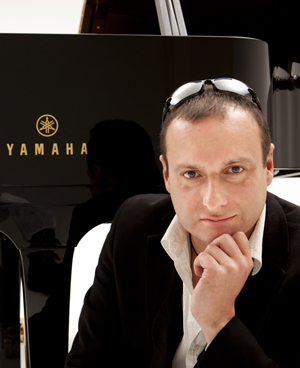 He has performed / broadcast on four continents in many of the world leading concert venues. Of note, Mark played alongside Peter Donohoe, Dmitri Alexeev, Boris Berezovsky and Nikolai Demidenko at the Queen Elizabeth Hall in a 60th Anniversary Gala tribute to John Ogden. He has also performed Ronald Stevenson's epic Passacaglia on DSCH (the longest piece of continuous music written for any instrument in history) along with works by Easterbrook and Bingham at Wigmore Hall (BBC), South Melbourne Town Hall (ABC) and Carnegie Hall (UK-in-NY Benefit Concert for those effected by September 11, New York) where he received standing ovations. As a chamber musician he has toured extensively with the virtuoso cellist Mats Lidstrom. Recent performances include Concerts / Broadcasts as diverse as Messiaen's Vingt Regards surl'Enfant- Jésus and Bach's Goldberg Variations. Richard Dain writes "I have no doubt that we are hearing one of the great pianists of the next century".